Action Data Binding Quick Start | Appracatappra, LLC. 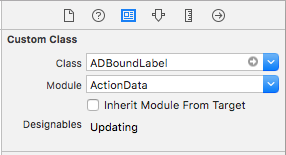 Our Action Data Binding controls allows you to quickly develop and maintain complex iOS forms and data displays by binding fields in your data model (any Swift class or structure that conforms to the Codable protocol) to UI elements in your Storyboard in Interface Builder via designable properties. ADBoundViewController – Manages the binding process. ADBoundLabel – Displays a short amount of text. ADBoundTextField – Edits a short amount of text. ADBoundTextView – Edits a block of text. ADBoundSlider – Displays a slider for the user to pick a number from a minimum and maximum value. ADBoundSwitch – Edits an on/off state. ADBoundProgressView – Displays a percent complete for a number inside of a range of numbers. ADBoundStepper – Edits a value by incrementing or decrementing it by a given amount. ADBoundImageView – Displays an image. ADBoundWebView – Displays a URL or raw HTML code. ADBoundSegmentedControl – Allows the user to select from a very limited set of options. ADBoundTextPicker – Allows the user to select from a set of options. Action Data is available free of charge under the MIT License from GitHub. 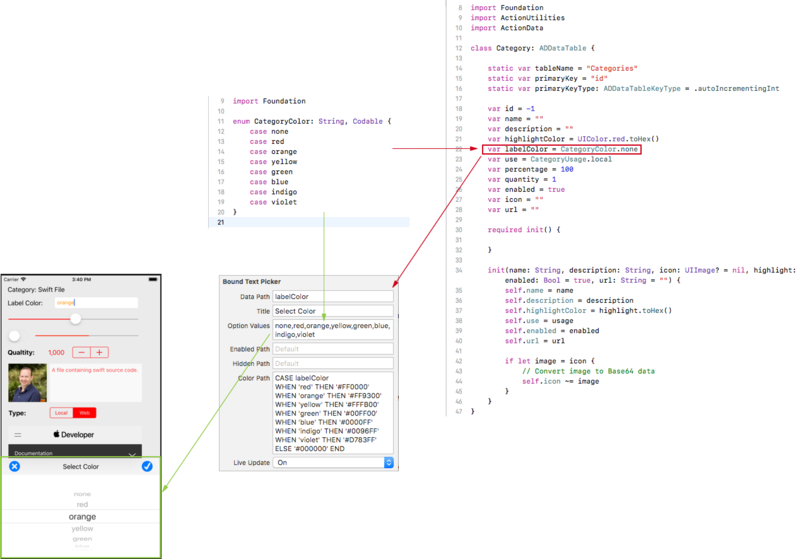 In the above class, we are using features of Action Utilities to store an image as a Base 64 encoded string and colors as a string in the form #RRGGBB so that the class can be Codable (since neither UIImage or UIColor conform to Codable). The Action Data Binding controls can accept and work with images and colors in these formats automatically. Additionally, Action Data Binding controls handle enums that are backed by String or Integer values such as the CategoryUsage and CategoryColor enums above. You’ll add a ADBoundViewController and one or more controls conforming to the ADBindable protocol to your UI design to view and/or modify data in your model. At a bare minimum, you will need to define the Data Path (where to get the data from as defined as a Key Path) that will either be the name of a field in our data model or a formula in the syntax similar to a SQL where or select clause. Depending on the control, other paths exist to show or hide the control, enable or disable it, format the value displayed or update the UI based on the data entered. Set these values as needed and repeat these steps to add more bound controls and fill out the required User Interface. 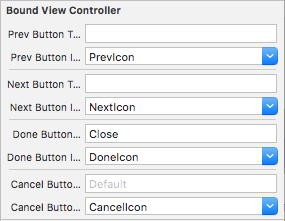 The ADBoundViewController will automatically find every Bound Control in the View and Subviews it controls and will populate the values based on the Key Paths you configured in Interface Builder. Specify either the text for the button a given Accessory View button or select an image (added to the app’s Assets.xcassets) to display as an icon on the button (as seen in the screenshots above). The following sections provide a deep look into the Data Binding process including Key Paths and formulas, automatically formatting values and the available Data Bound Controls. Note: A Key Path is case sensitive and must match the name and case of a data model field exactly to be automatically bound successfully. Data Path – Can either be a Int, Float or a String value. If a String is given, the control will attempt to convert it to a valid Float value. 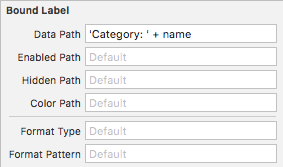 Enabled Path, Hidden Path – Can either be a Bool, Int, Float or a String value. If the value is an Int or Float, 0 and 1 will be converted to false and true. If the value is a String, “yes”, “on”, “true” or “1” will be converted to true, all other values will result in false. RR is a hex value for the red channel. GG is a hex value for the green channel. BB is a hex value for the blue channel. AA is a hex value for the alpha (or transparency) channel. Where the Data Path should be a String value. If the value is an Int or Float it will be converted to its string representation. If the value is a Bool it will be converted to the string values of true or false. Where the Data Path should be a String value containing a Base 64 encoded image. Just like a regular Key Path, a Path Formula should return the appropriate type of data for a given path, such as the String value of the Bound Label’s Data Path or a String in the form #RRGGBB for the Bound Text Picker’s Color Path above. When you include the name of a field from your data model in a formula, its value will be read during data binding, converted to the correct type required by the formula and used in evaluating the formula. For controls that edit data (such as a Bound Text Field), you should not set the Data Path using a formula because the ADBoundViewController will not be able to read user edits back into the data model. String values may contain constants enclosed in single quotes, such as 'Hello World'. Additionally, string values can be combined using the + such as 'Hello' + ' ' + 'World'. String values can be compared using =, !=, <, >, <= or >=. % – The percent sign represents zero, one, or multiple characters. _ – The underscore represents a single character. Use the SQL REGEX statement to test a string against a regular expression. For example: myField REGEXP '\b3\b'. Use the SQL IN statement to test if the string is one of a possible set of values. For example: myField IN('one', 'two', 'three'). Numeric values can be computed using +, -, *, / and formulas can use parentheses to control the evaluation order. For example: (myField + 10) / 100. Numeric values can be compared using =, !=, <, >, <= or >=. Use the SQL BETWEEN statement to test if a number is between two values. For example: myField BETWEEN 0 AND 100. Use the SQL IN statement to test if the number is one of a possible set of values. For example: myField IN(1, 2, 3). Use AND, OR and NOT to evaluate boolean values. For example: myField > 0 AND myField < 100. Additionally, use parentheses to control the evaluation order. For example: (myField > 0 AND myField < 100) OR myField = 1000.
ltrim(value) – Trims any white space characters off of the left side of the given string value. trim(value) – Trims any white space characters from both the left and right side of the given string value. rtrim(value) – Trims any white space characters off of the right side of the given string value. instr(value, pattern) – Returns true if the given string contains the given pattern. For example: instr(myField, 'hello'). replace(value, pattern, replacement) – Replaces all occurrences of the pattern with the replacement value. For example: replace(myField, 'hello', 'hi'). substr(value, position, length) – Returns a section of the given string starting at character position for length characters. For example: substr(myField, 4, 2). upper(value) – Returns the string converted to uppercase. lower(value) – Returns the string converted to lowercase. length(value) – Returns the number of characters in the given string. abs(value) – Returns the absolute value of the given number. random() – Returns a random number between 0 and 64,000,000.
random(value) – Returns a random number between 0 and value. random(low, high) – Returns a random number between low and high. Allows you to convert numeric values to their textual representations. For example: ###,### would output the value 1000 as 1,000. The Bound Label and Bound Text Field expose the formatter via the numberFormatter property if you need to configure more options. See Apples NumberFormatter documentation for more details. Allows you to convert date and time values to their textual representations. For example: mm/dd/yyyy would output a date as 01/01/2018. The Bound Label and Bound Text Field expose the formatter via the dateFormatter property if you need to configure more options. See Apples DateFormatter documentation for more details. This section will take a detailed look at the Bound View Controller and each of the Data Bound Controls provided. A ADBoundViewController provides a method to attach it to a data model (any Swift class or structure that conforms to the Codable protocol) and any control conforming to the ADBindable protocol on any View or SubView will automatically be populated with the values from the data model based on the dataPath property of the control. By using the setDataModel function to set the model and automatically populate the fields, you to not need to create Actions or Outlets for the individual controls. The ADBoundViewController will automatically handle the reading and writing of properties for you. For any ADBindable control that is editable, calling the getDataModel function will return the values from the controls on the View and SubViews. These will be written to the field of the data model as specified by the dataPath property of the control, as a result, a formula should not be used for the dataPath of any field that is readable. For any field that requires onscreen keyboard support, the ADBoundViewController will automatically handle keyboard events such as moving fields hidden by the keyboard so they are visible and moving them back after they lose focus. Accessory tools can be automatically added to the keyboard to move between the text entry fields and to close the keyboard based on options for each control. These buttons can be customized using the prevButtonText, prevButtonImage, nextButtonText, nextButtonImage, doneButtonText and doneButtonImage properties of the ADBoundViewController. The ADBoundTextPicker control has an embedded picker view that will be handled automatically by the ADBoundViewController in a similar fashion as the onscreen keyboard. If the field is covered by the picker, it will be moved automatically to be shown and moved back when the picker is closed. 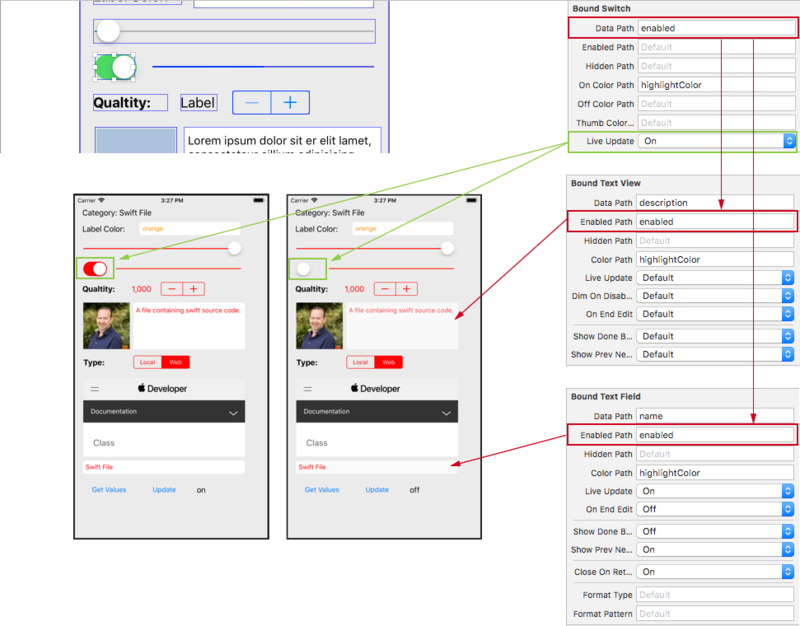 An accessory toolbar will be added to the picker that can be customized with the cancelButtonText, cancelButtonImage, doneButtonText and doneButtonImage properties of the ADBoundViewController. record – A ADRecord that holds the value from the data model while the form is being displayed or edited as key/value pairs. The setDataModel function populates this dictionary and the getDataModel function reads the results back. Between those calls you can manipulate the values directly in the record dictionary if required. prevButtonText – Defines the text of the previous button that can be displayed in the onscreen keyboard accessory view. prevButtonImage – Defines the image for the previous button that can be displayed in the onscreen keyboard accessory view. nextButtonText – Defines the text of the next button that can be displayed in the onscreen keyboard accessory view. nextButtonImage – Defines the image for the next button that can be displayed in the onscreen keyboard accessory view. doneButtonText – Defines the text of the done button that can be displayed in the onscreen keyboard and picker view accessory view. doneButtonImage – Defines the image for the done button that can be displayed in the onscreen keyboard and picker view accessory view. cancelButtonText – Defines the text of the cancel button that can be displayed in the onscreen keyboard and picker view accessory view. cancelButtonImage – Defines the image for the done button that can be displayed in the onscreen keyboard and picker view accessory view. setDataModel(model) – Attaches the given data model (any Swift class or structure conforming to the Codable protocol) to the ADBoundViewController populating the record property and any control conforming to the ADBindable protocol on any View or SubView. getDataModel(Model.self) – Reads the values from any editable control conforming to the ADBindable protocol into the given data model (any Swift class or structure conforming to the Codable protocol). updateBindings() – Forces the ADBoundViewController to update the values of any control conforming to the ADBindable protocol on any View or SubView controlled by this ADBoundViewController with the values from the record property. updateRecord() – Forces the ADBoundViewController to update the record property with the values from any editable control conforming to the ADBindable protocol on any View or SubView controlled by this ADBoundViewController. 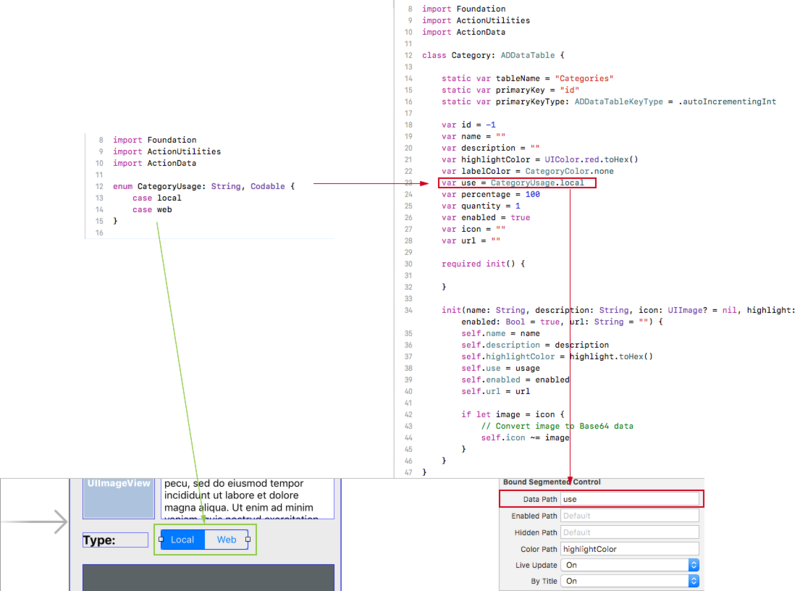 refreshDisplay() – Forces the ADBoundViewController to read the values from any bound control in the controls array into the record property and write the values back to the bound controls to refresh the view. Creates a label that can be bound to a value from a data model that conforms to the Codable protocol when placed on a ADBoundViewController view. Use the dataPath property to specify the field from the bound data model to populate the label from or supply a formula in a SQL like syntax. dataPath – The name of the field from the date model or formula (using SQL syntax) used to populate the text of the label from. enabledPath – The name of the field from the date model or formula (using SQL syntax) used to set the hidden state from. hiddenPath – The name of the field from the date model or formula (using SQL syntax) used to set the hidden state from. colorPath – The name of the field from the date model or formula (using SQL syntax) used to set the text color from. formatType – Defines the type of formatter that will be used to format the value of this text field before it is displayed to the user. The currently supported formats are “number”, “masked” or “date”. formatPattern – Works with the formatType property to format the value that is displayed to the user based on the pattern given in this string. For example, $###,###.00 for a number or mm/dd/yyyy for a date. numberFormatter – Built-in number formatter used with the formatType of number and formatPattern properties to automatically format numeric values. dateFormatter – Built-in date formatter used with the formatType of date and formatPattern properties to automatically format date/time values. maskedFormatter – Built-in masked string formatter used with the formatType of masked and formatPattern properties to automatically format string values. Creates a text field that can be bound to a value from a data model that conforms to the Codable protocol when placed on a ADBoundViewController view. Use the dataPath property to specify the field from the bound data model to populate the text field from or use a formula in a SQL like syntax. dataPath – The name of the field from the date model or formula (using SQL syntax) used to populate the text of the field from. liveUpdate – If true this text view cause the parent ADBoundViewController to update the form when the value changes. Works with the onEndEdit property, if it’s true the change will only be sent when the user finishes editing the field, else the change will be sent on individual character changes. onEndEditing – Works with the liveUpdate property, if it’s true the change will only be sent when the user finishes editing the field, else the change will be sent on individual character changes. showDoneButton – If true a Done accessory button will be displayed along with the onscreen keyboard when this field is edited. 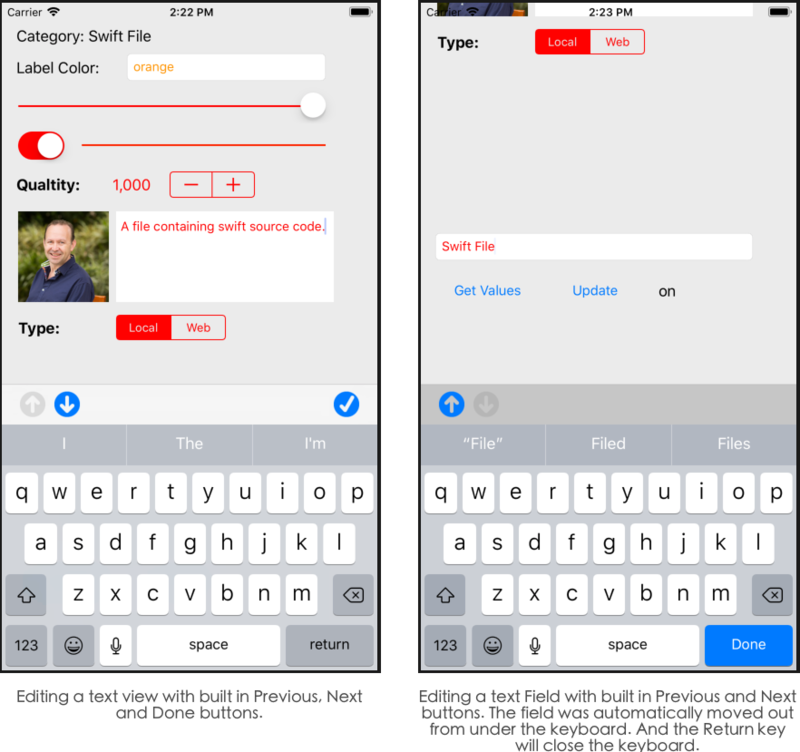 showPrevNextButtons – If true Previous and Next accessory buttons will be displayed along with the onscreen keyboard when this field is edited. 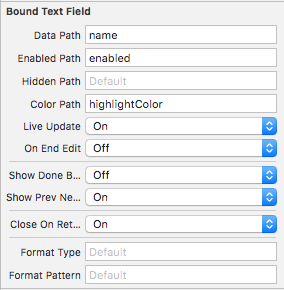 closeOnReturn – If true this ADBoundTextField will resign first responder and close the onscreen keyboard when the Return key is tapped. Creates a text view that can be bound to a value from a data model that conforms to the Codable protocol when placed on a ADBoundViewController view. Use the dataPath property to specify the field from the bound data model to populate the text view from or a formula in a SQL like syntax. Creates a slider that can be bound to a value from a data model that conforms to the Codable protocol when placed on a ADBoundViewController view. Use the dataPath property to specify the field from the bound data model to populate the slider’s value from or use a formula in a SQL like syntax. dataPath – The name of the field from the date model or formula (using SQL syntax) used to populate the current value of the slider from. 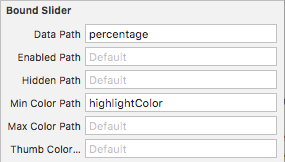 minColorPath – The name of the field from the date model or formula (using SQL syntax) used to set the minimum track tint color from. maxColorPath – The name of the field from the date model or formula (using SQL syntax) used to set the maximum track tint color from. thumbColorPath – The name of the field from the date model or formula (using SQL syntax) used to set the thumb tint color from. liveUpdate – If true this slider cause the parent ADBoundViewController to update the form as the value of the slider changes. Creates a switch that can be bound to a value from a data model that conforms to the Codable protocol when placed on a ADBoundViewController view. Use the dataPath property to specify the field from the bound data model to populate the switch from or a formula in a SQL like syntax. dataPath – The name of the field from the date model or formula (using SQL syntax) used to populate the current value of the switch from. onColorPath – The name of the field from the date model or formula (using SQL syntax) used to set the on tint color from. 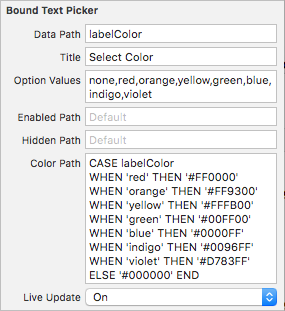 offColorPath – The name of the field from the date model or formula (using SQL syntax) used to set the off tint color from. liveUpdate – If true this switch cause the parent ADBoundViewController to update the form as the value changes. Creates a progress view that can be bound to a value from a data model that conforms to the Codable protocol when placed on a ADBoundViewController view. Use the dataPath property to specify the field from the bound data model to populate the progress from or a formula in a SQL like syntax. dataPath – The name of the field from the date model or formula (using SQL syntax) used to populate the current value of the progress view from. progressColorPath – The name of the field from the date model or formula (using SQL syntax) used to set the progress tint color from. 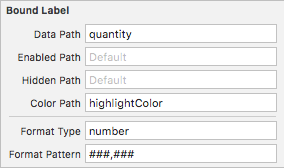 trackColorPath – The name of the field from the date model or formula (using SQL syntax) used to set the track tint color from. minValue – Sets the minimum value for the progress view. maxValue – Sets the maximum value for the progress view. Creates a stepper that can be bound to a value from a data model that conforms to the Codable protocol when placed on a ADBoundViewController view. Use the dataPath property to specify the field from the bound data model to populate the stepper’s value from or a formula in a SQL like syntax. dataPath – The name of the field from the date model or formula (using SQL syntax) used to populate the current value of the stepper view from. 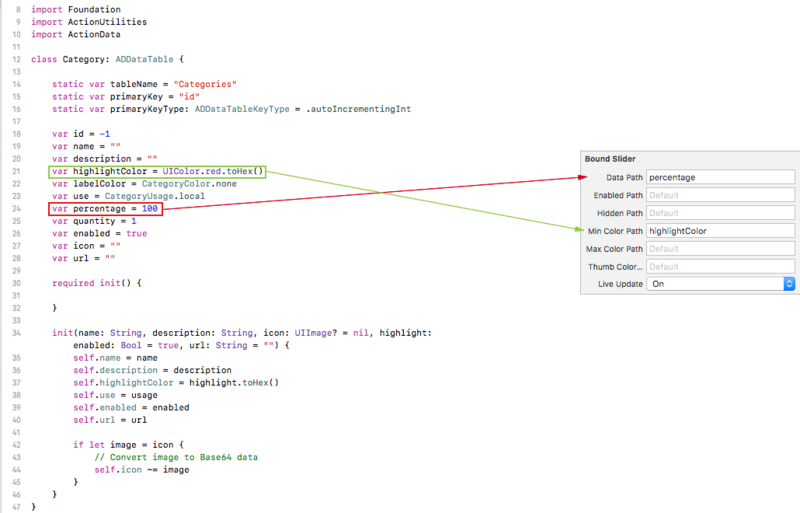 colorPath – The name of the field from the date model or formula (using SQL syntax) used to set the tint color from. liveUpdate – If true this stepper cause the parent ADBoundViewController to update the form as the value changes. Creates an image view that can be bound to a value from a data model that conforms to the Codable protocol when placed on a ADBoundViewController view. Use the dataPath property to specify the field from the bound data model to populate the image view from or a formula in a SQL like syntax. dataPath – The name of the field from the date model or formula (using SQL syntax) used to populate the image from. Creates a web view that can be bound to a value from a data model that conforms to the Codable protocol when placed on a ADBoundViewController view. Use the dataPath property to specify the field from the bound data model to use as the URL or the HTML data to display in the web view. Use the containsHTML property to decide if the dataPath contains a URL or HTML data. dataPath – The name of the field from the date model or formula (using SQL syntax) used to populate the web view from as either a URL or raw HTML. containsHTLM – If true the dataPath property contains raw HTML that needs to be displayed, if false the dataPath contains a URL to display. Creates a segmented control that can be bound to a value from a data model that conforms to the Codable protocol when placed on a ADBoundViewController view. Use the dataPath property to specify the field from the bound data model to select the segment from or use a formula in a SQL like syntax. Use the byTitle property to decide if the segment is selected by title or integer position. dataPath – The name of the field from the date model or formula (using SQL syntax) used to set the currently selected segment from. liveUpdate – If true this segmented control causes the parent ADBoundViewController to update the form as the value changes. byTitle – If true the segment is selected by its title, else it is selected by its integer position. Creates a text field that can be bound to a value from a data model that conforms to the Codable protocol when placed on a ADBoundViewController view. Use the dataPath property to specify the field from the bound data model to populate the text field from or use a formula in a SQL like syntax. Includes a builtin picker control used to select the value from a list of available values. dataPath – The name of the field from the date model or formula (using SQL syntax) used to set the currently selected item from. title – Sets the title that is displayed over the picker view. optionsValues – Defines a comma separated list of options that will be displayed in the attached picker controller for the user to select from. Updating this property will automatically update the optionList property. liveUpdate – If true this text view cause the parent ADBoundViewController to update the form when the value changes. optionList – Gets or sets the list of options that will be displayed in the picker view when the users edits the field.